English wildlife enthusaist Sir David Attenborugh OM, CH, CVO, CBE, FRS, FZS, FSA was born on this date 8th May in 1926. He is a younger brother of the late director, producer and actor Richard Attenborough and His career as the face and voice of natural history programmes has endured for more than 50 years. He is best known for writing and presenting the Life series, in conjunction with the BBC Natural History Unit, which collectively form a comprehensive survey of all life on the planet. Attenborough grew up in College House on the campus of the University College, Leicester, where he spent his childhood collecting fossils, stones and other natural specimens. He received encouragement in this pursuit at age seven, and one of his adoptive sisters also gave him a piece of amber filled with prehistoric insects. He was educated at Wyggeston Grammar School for Boys in Leicester and then won a scholarship to Clare College, Cambridge in 1945, where he studied geology and zoology and obtained a degree in natural sciences. In 1950, he applied for a job as a radio talks producer with the BBC and attracted the interest of the head of the Factual broadcasting department of the BBC and joined the BBC full-time. 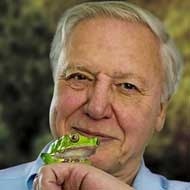 Attenborough’s association with natural history programmes began when he produced and presented the three-part series The Pattern of Animals, which discussed the use of camouflage, aposematism and courtship displays among animals. Through this programme.Attenborough met the curator of the zoo’s reptile house, and they decided to make a series about an animal-collecting expedition. The result was Zoo Quest, first broadcast in 1954, which Attenborough presented. In 1957, the BBC Natural History Unit was established and Attenborough formed the Travel and Exploration Unit, allowing him to continue to front Zoo Quest as well as produce other documentaries, notably the Travellers’ Tales. Attenborough also began studying for a post-graduate degree in social anthropology at the London School of Economics, however he returned to the BBC as controller of BBC Two before he could finish the degree and became the controller of BBC Two in March 1965 but was allowed to continue sudying as well as making programmes on an occasional basis. Later the same year, he filmed elephants in Tanzania, and in 1969, he made a series on the cultural history of the Indonesian island of Bali. For the 1971 film A Blank on the Map, he joined the first Western expedition to a remote highland valley in New Guinea to seek out a lost tribe. He also has the distinction of having a number of newly-discovered species and fossils being named in his honour. In 1993, a fossilised Mesozoic armoured fish discovered in Western Australia was given the name Materpiscis attenboroughi, which is also believed to be the earliest organism capable of internal fertilisation. He has also lent his name to a species of Ecuadorian flowering tree, Blakea attenboroughi, one of the world’s largest-pitchered carnivorous plants, Nepenthes attenboroughii, and one of only four species of long-beaked echidna, the critically endangered Zaglossus attenboroughi, discovered by explorer and zoologist Tim Flannery in the Cyclops Mountains of New Guinea in 1998, and In September 2009, London’s Natural History Museum opened the Attenborough Studio, part of its Darwin Centre development. Attenborough’s contribution to broadcasting and wildlife film-making has brought him international recognition. He has been called “the great communicator, the peerless educator” and “the greatest broadcaster of our time”. His programmes are often cited as an example of what public service broadcasting should be, and have influenced a generation of wildlife film-makers. World Red Cross and Red Crescent Day is an event held annually on 8 May which celebrates of the principles of the International Red Cross and Red Crescent Movement. This date is the anniversary of the birth of Henry Dunant (born 8 May 1828), the founder of International Committee of the Red Cross (ICRC) and the recipient of the first Nobel Peace Prize. The idea for an “annual action which could take hold in the whole world and would be a major contribution to peace” was introduced just after World War I. This evolved out of the “Red Cross Truce, an initiative that was studied by an international commission established at the 14th International Conference of the Red Cross. Its results, presented to the 15th International Conference in Tokyo in 1934, was approved and having considered the principles of the truce, and its applicability across different regions of the world, the General Assembly of the International Federation of the Red Cross Societies (IFRC) asked the League of the Red Cross Societies (LORCS) to study the feasibility of adopting an annual International Red Cross Day. Two years later, the proposal was adopted and the first Red Cross Day was celebrated on 8 May 1948. The official title of the day has changed over time, and it became “World Red Cross and Red Crescent Day” in 1984. Until recently Many Polls including BBC’s exit Poll, suggested that Britain was heading for a hung parliament (some of them want hanging) where neither Ed Miliband or David Cameron would get a majority in the general election. However the Conservatives reached an overall majority of 326 seats in the House of Commons and David Cameron was elected for another Term of Office. The result prompted Ed Miliband to resign as Labour Leader and Nigel Farage to resign as UKIP Leader. Ed Balls also lost his Labour seat in Scotland to Conservatives and many former Labour seats were claimed by the Scottish National Party. The Television was wall to wall coverage With David Dimbleby, Nick Robinson, Emily Maitlis, Vine and Andrew alongside Huw Edwards presenting coverage on BBC, meanwhile Over on ITV: Political editor Tom Bradby presented, with Julie Etchingham and Nina Hossain. On Sky News: Adam Boulton, was joined by political editor Faisal Islam, and Elsewhere Eamonn Holmes, Dermot Murnaghan, Jeremy Paxman, added their input. However Parliament isn’t due back until 18 May. The Queen’s speech is pencilled in for 27 May. And a formal vote on it probably wouldn’t happen until 2 or 3 June. May 8 2015 marks the 70th Anniversary of VE Day. 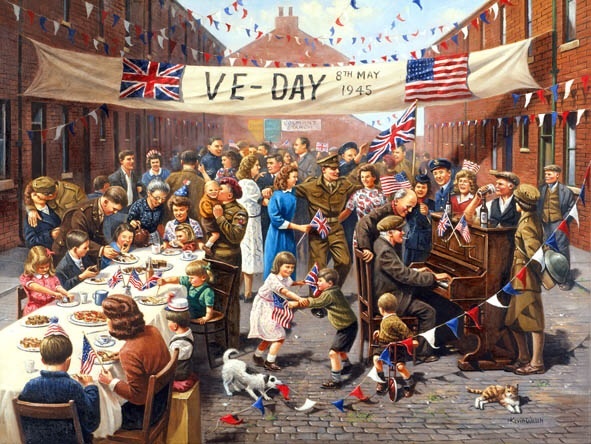 VE Day (Victory in Europe Day, is celebrated annually on 8 May to commemorate the formal unconditional surrender of Nazi Germany’s Armed Forces following the suicide of Nazi Leader Adolf Hitler on 30 April 1945 during the Battle of Berlin. It marked the end of World War II in Europe and was authorised by Hitler’s successor, Reichspräsident Karl Dönitz of the Flensburg Government. The act of military surrender was signed on 7 May in Reims, France and on 8 May in Berlin, Germany and is commemorated as VE Day. Upon the defeat of Germany, celebrations erupted throughout the world. From Moscow to Los Angeles, people celebrated. In the United Kingdom, more than one million people celebrated in the streets to mark the end of the European part of the war. In London, crowds massed in Trafalgar Square and up the Mall to Buckingham Palace, where King George VI and Queen Elizabeth, accompanied by Prime Minister Winston Churchill, appeared on the balcony of the palace before the cheering crowds. Princess Elizabeth (the future Queen Elizabeth II) and her sister Princess Margaret were allowed to wander incognito among the crowds and take part in the celebrations.